The BIGGEST cause of choking and how to prevent it! In 1985 Olympic Gold Medallist in Archery John Williams came to Singapore on an IOC Sponsored Coaching Seminar of which I was one of the participants. One of the biggest things he communicated - if you're competing you shouldn't be coaching. To paraphrase for the martial arts community - You shouldn't be looking at video of yourself practicing, and you shouldn't be trying to analyse what you're doing. You should just simply do what you do to perform your best. Simply said. That's me in 1985 - by that time I was already in my second year of representing Singapore - and training martial arts. Because of archery I found I could skip school for cool events like this one plus go on free trips through the year. behavioural tics which affect preparation and training. 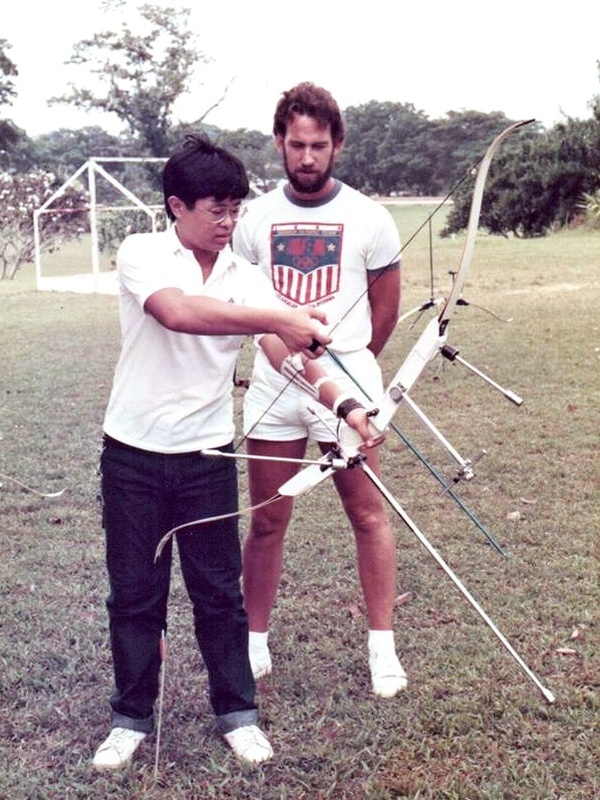 As a coach I like to focus on broad concepts and the ideals of what we're trying to do with the individual archer. I say this to frame instances when I do have to correct aspects of a practitioner's form. Again, I'm careful not to use the word 'goals' as reflected in Dr Alan Goldbergs video above. Such goals as he mentions are training-oriented, or at least is a practice-oriented process, and should be left in training. In my own experience there are times when I may correct an archer, or when I attempt to modify a certain aspect of their form, this may result in a better or more consistent shot. However, left alone, that archer then might think that to continue to emphasize that specific instruction or to work on that specific component to the nth degree - which results in an over-exaggeration of the initial tweak - which in turn results in over-correction, and then screws up his form. Dr Goldberg mentions that an athlete can even bring these goals or expectations or understand to a competition. "I want to win" or "I need to push myself harder" or "I want to beat this competitor". However, he says when you bring these goals, it creates an inner urgency which then wrecks your performance. The more you focus on the process or the outcome or the game plan, the further you are from being "in the moment". As an practitioner, or as a parent, or as a coach ... we must guard against anything that brings you 'out of the moment' or away from 'the zone'. When the coach tells you to focus on something, you may temporarily do so, but being in the moment is where your efforts should be directed to. This pertains to both sportive competition and self defence! What to do during practice - take some time to dump all unproductive thoughts on paper. Or compartmentalise them in your mind and park them - and resolve them later. Focus on positive thoughts during your setup and warmup. What to do before an event - have a plan of what you're going to do, sleep well, do not eat a heavy meal, banish neurotic thoughts, and go through personal relaxation techniques. During the event - step through the mental visualisation plan that gets yourself into the zone. After the shoot - reward yourself regardless how well you did. Give yourself a good break. Other pursuits are important too. And make sure you go through rest, recuperation and rehabilitation! This is a really good video for all of us. ps. Look at the martial arts weapons he's got hanging on his wall!